It’s that time of year again. Time for me to climb out from under my rock, mount up on that soapbox and offer alternatives to candy filled Valentines. Like to hear it? Here it goes. This year, Atlas wanted to give his friends clown noses. I thought it was the best idea ever. What’s not to like? 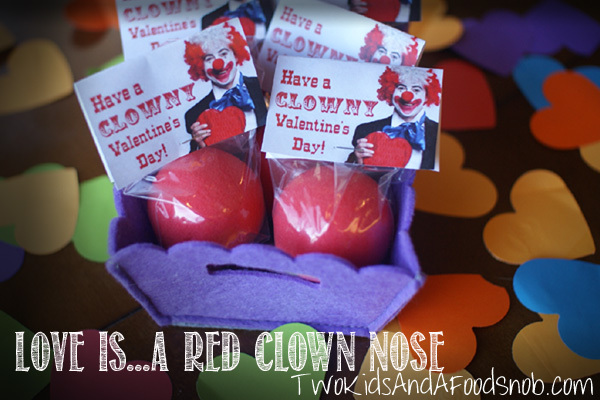 We tossed around ideas for the cards, but Atlas insisted on “Have a Clowny Valentine’s Day”. I quickly popped the tops off, printed folding cards on cardstock and attached them to the top of the bag. Atlas threw a signature on them, and we called it good. Easiest Valentine Ever. After last year’s fiasco, I think we earned an easy one. They were a huge hit with his Kindergarten class, it’s always fun to see a group of kids in clown noses. Total cost: $17 for 36 Valentines. I ordered the noses from Amazon because I abuse prime shipping to make up for my own procrastination. I printed the cards at Office Depot for a few dollar, since I was printing a photo and didn’t have cardstock at home, it was the most cost effective option for this project. Do yourself a solid and save some time. You can download the printable file I made here. Tags: Candy Free Valentines. Bookmark the permalink.